In 1926 Ebauches SA was created by three major watch companies (A. Schild AG, Fabrique d’Horlogerie de Fontainemelon and A. Michel AG), as a holding company for Swiss watch movement manufacturers. 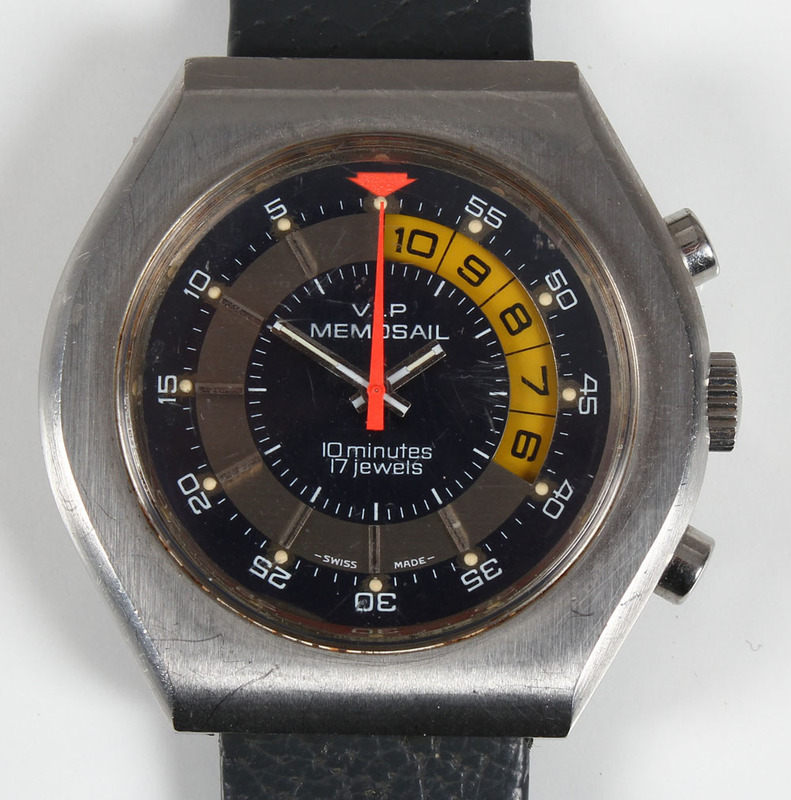 The purpose of this merger was to bring order in this chaotic industry, and to keep the prices of watch movements from falling any further. 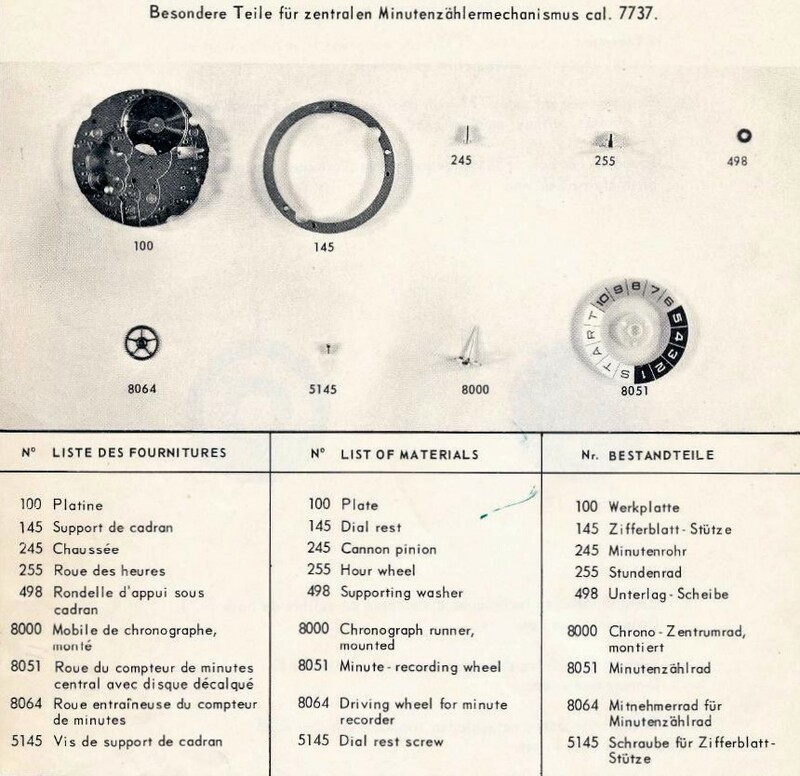 By 1951 Ebauches SA had bought as many as 75 movement manufacturers! 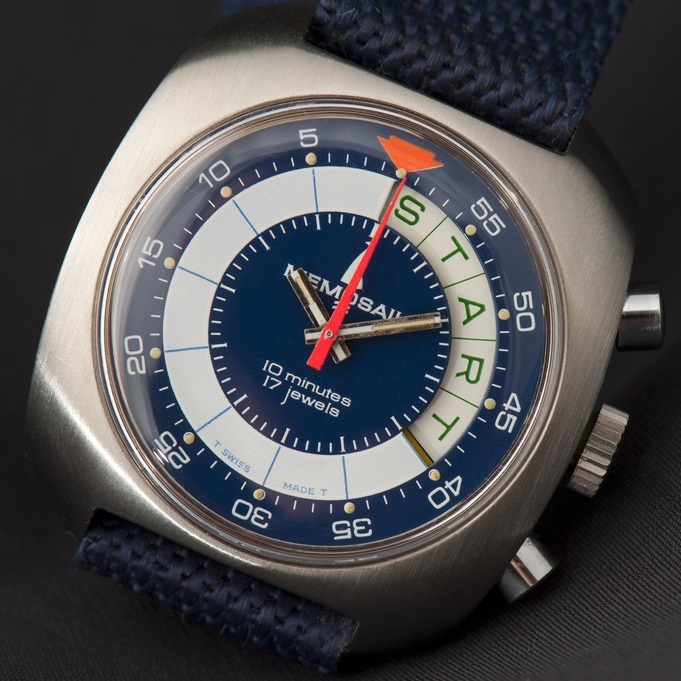 Eventually in 1985 most of the companies that became part of Ebauches SA were bought into the Swatch Group under the ETA division. 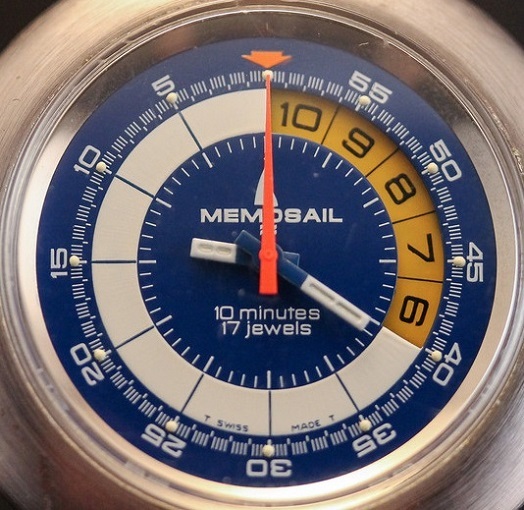 In 1970 daughter company Ebauches Electroniques SA was founded, and that company filed in 1972 for the trademark name Memosail. 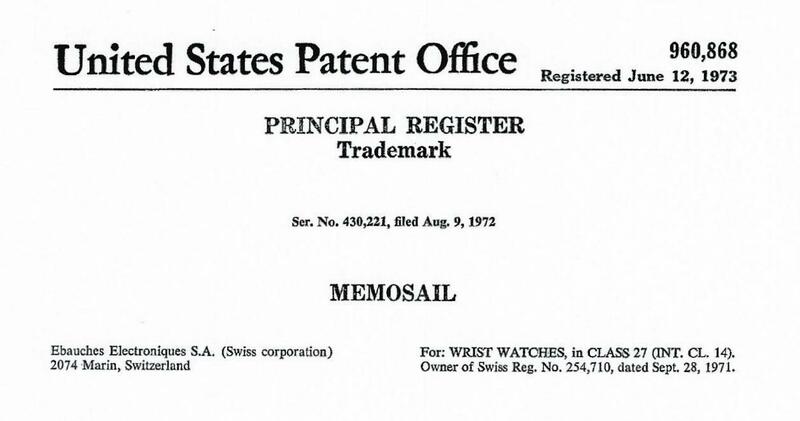 Registration of the trademark name Memosail, June 12 1973. Apparently the idea had risen to make a new regatta watch to compete with the Aquastar company and the Felsa regatta movement (caliber 4000N). 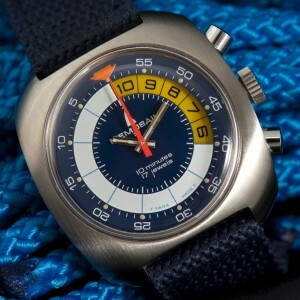 For that reason the Swiss manufacturer of mechanical movements Valjoux SA (also a daughter company of the Ebauches group) developed their caliber Valjoux 7737, derived from the base caliber 7733, with a slightly different approach to count the remaining time to the start of a regatta. When at zero the indicator disk shows START in a cut-out section in the dial. 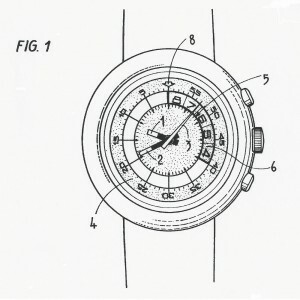 On February 25th, 1972 Valjoux SA filed their patent for a ‘Pièce d’horlogerie à mécanisme de chronographe’. Fig. 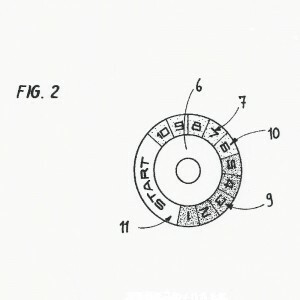 1 and 2 of the Valjoux patent. 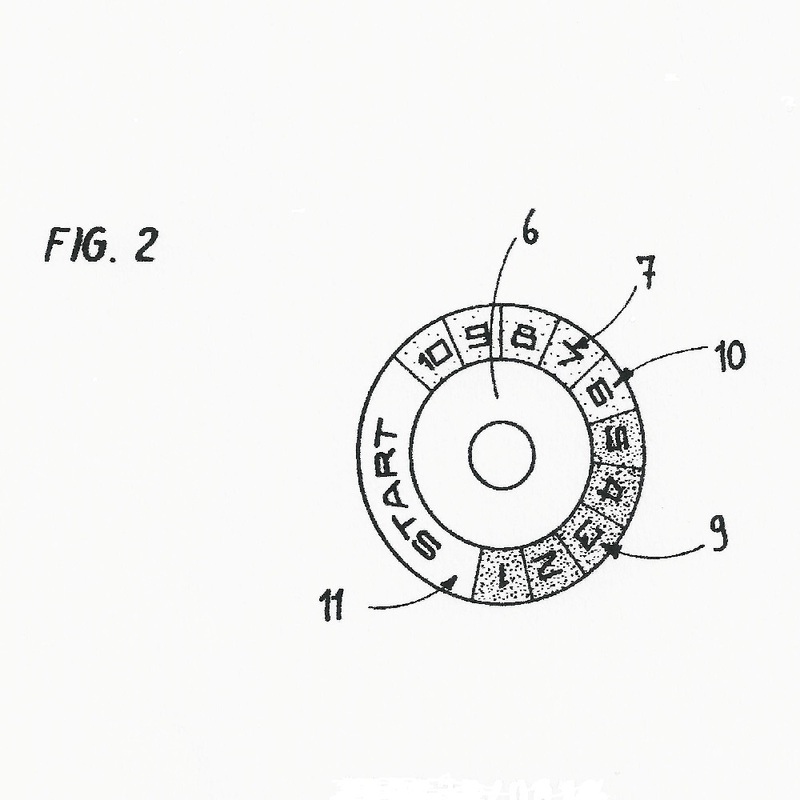 You can download the Swiss patent CH566052 as PDF here, and here you can download a parts list for the modifications in the Valjoux 7737 caliber. 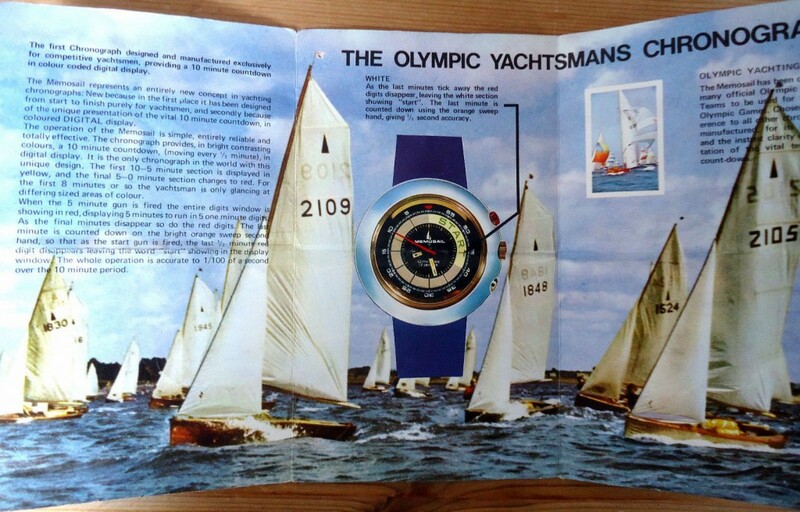 Brochure of the first edition Memosail, the Olympic Yachtsmans Chronograph. The first version (around 1972) of the Memosail regatta watch was housed in a chrome plated brass round case, later versions (as of 1975) came in an almost square case. At first also made of chrome plated brass, later on made of stainless steel. All three versions have a stainless steel caseback, as this material is very strong and resistant to corrosive human sweat. 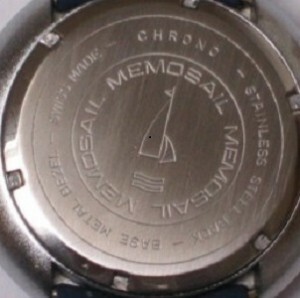 The Memosail regatta watch in a round case, and an almost square case. 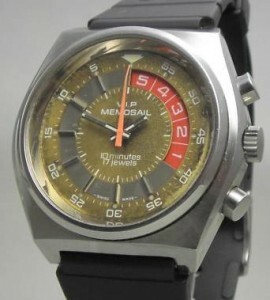 Model: Memosail, with round or square case. Caliber: manual wound Valjoux 7737 movement. Round case size: Ø 45,6 mm / H 13,5 mm. Square case size: 38,0 x 42,1 mm / H 14,0 mm. 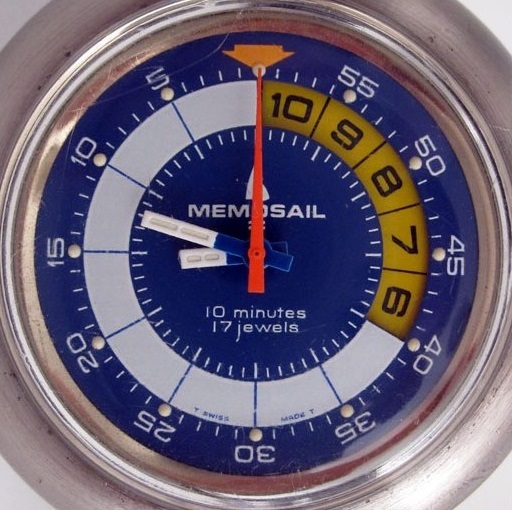 Unlike the Lemania 1345 movement (see the Aquastar 1970’s section) the Memosail has two pushers for the countdown function. One pusher at 2 o’clock for start/stop, and one pusher at 4 o’clock for reset. 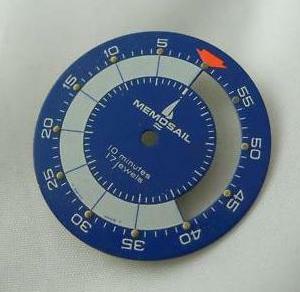 Under the dial is a plastic indicator disk divided in 15 segments for 15 minutes, of which 5 segments are shown through a large aperture in the dial from 12 to 4 o’clock to follow the countdown. After a reset it shows 10-9-8-7-6 in black figures on a yellow background. When the chrono is activated the countdown starts and the orange sweep hand is set in motion counting the seconds backwards from 60 to zero. After 30 seconds the indicator disk moves half a minute, and again after 60 seconds, now showing 9-8-7-6-5. So, after the first 5 minutes of the countdown the disk is showing 5-4-3-2-1 in white figures on a red background. The process repeats and after another 5 minutes it reads START in green capitals on a white base. It is striking that whereas the indicator disk in the Lemania 1345 moves clockwise, in the Memosail it runs anti-clockwise! 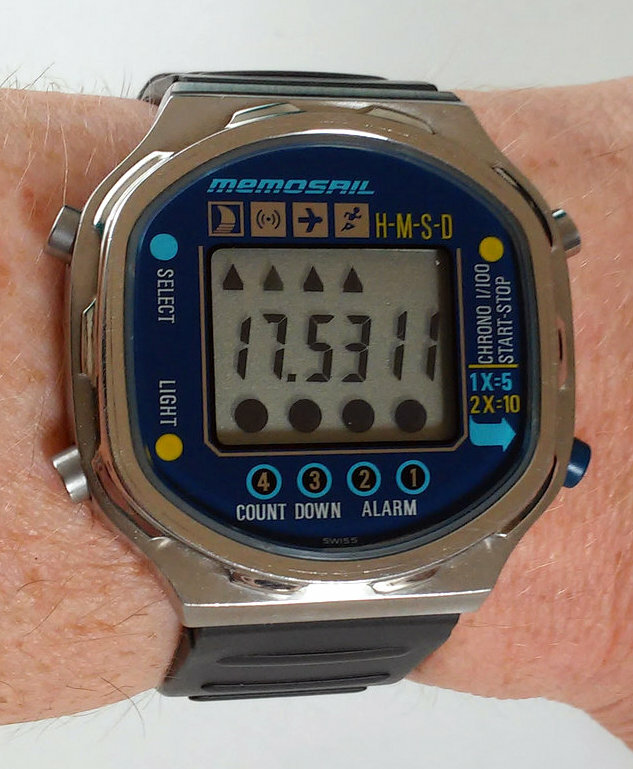 And whereas in the Lemania the indicator disk stops after the countdown comes to zero, in the Memosail it doesn’t. It keeps revolving showing again 10-9-8-7-6 after another 5 minutes, and so on. You have to stop the countdown with the stop pusher. 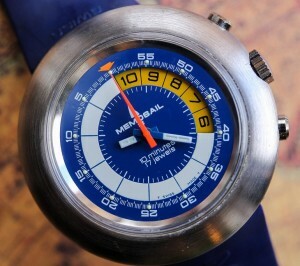 Blue dial Indicator disk Caliber 7737. 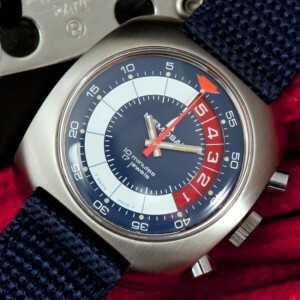 A comprehensive description of how the Valjoux 7737 regatta movement with its numbered indicator disk works, is written by Richard Askham on his webblog, read here. You can download a partslist for the specific 7737 parts in the movement here. Type: manual wound chronograph with yachttimer function. Size: 14″ Ø 31,05 mm. 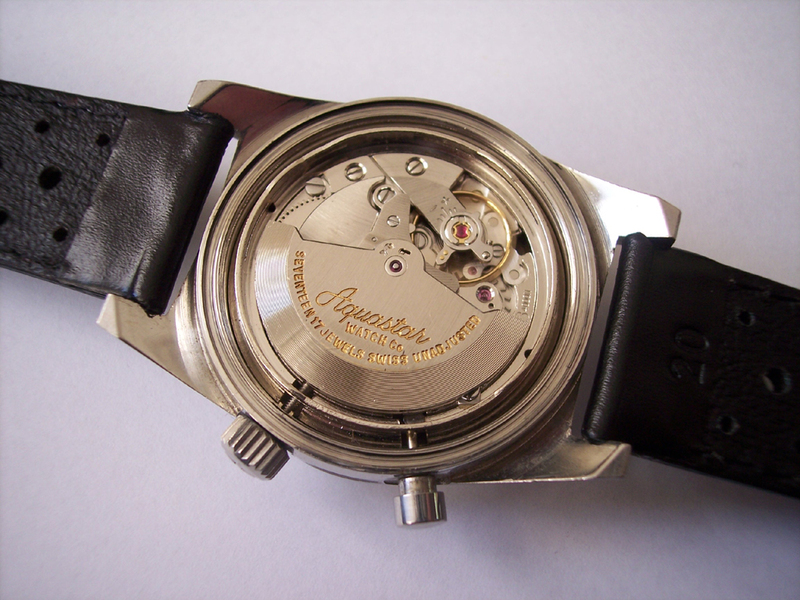 (as this movement was produced with both). Basic caliber is the Valjoux 7733/34 movement, modified with a regatta countdown function. 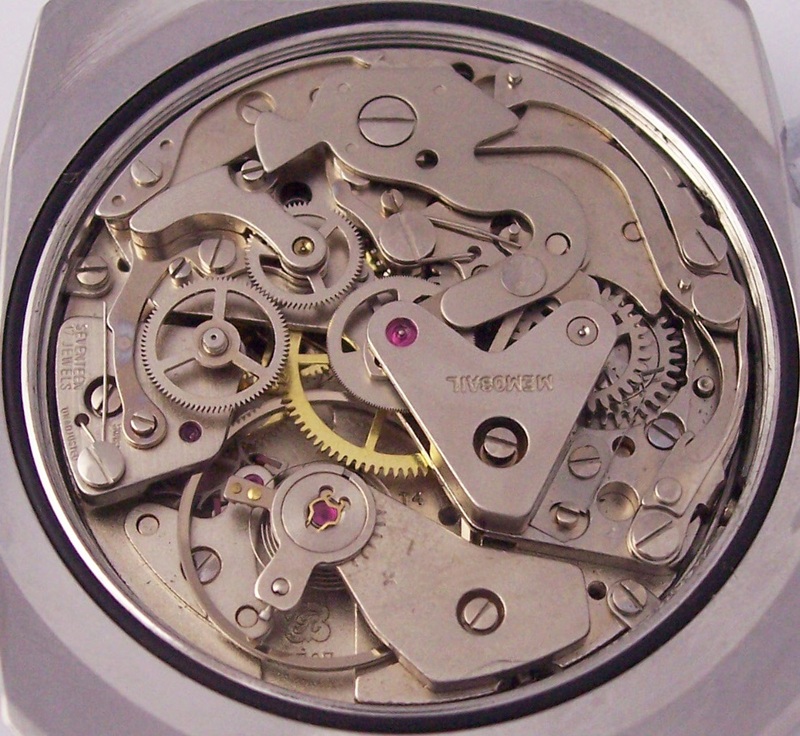 The caliber 7733 is a redesign of the caliber 7730, which in turn is a rebranded caliber Venus 188, after Valjoux had bought the Venus company in 1966. Scans from the original instruction manual for the round model. Scans from the original instruction manual for the square model. There are two different blue/white dials. One with a mark every 5th of a second, and probably the later one with a division per second. Both dials say ‘MEMOSAIL – 10 minutes – 17 jewels’. Blue/white dial with a 1/5 sec division, or with a 1 sec division. 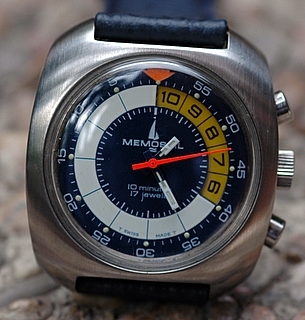 With an unusual big round case of 45,6 mm, this first version had its own blue rubber/silicone strap saying Memosail on one end and showing the Memosail logo and the word Swiss on the other end. It even has special curved springbars to fit the strap! 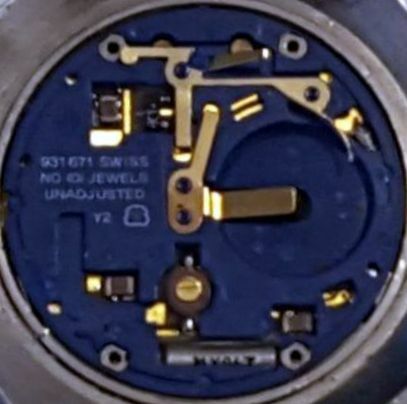 On the above picture you can clearly see that originally the start/stop pusher of the first round version was coloured red, as is shown on a picture of the watch on the original box. 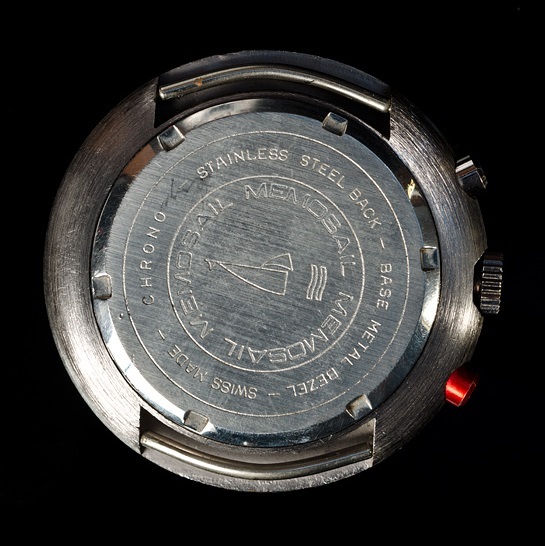 Of the later square version there are the ones made of chrome plated brass, saying ‘stainless steel back’ and ‘base metal bezel’ on the caseback, and the ones completely made of stainless steel saying ‘all stainless steel’ on the caseback. They were available with either a nylon strap or a steel bracelet, engraved with ‘MEMOSAIL’ and the logo. 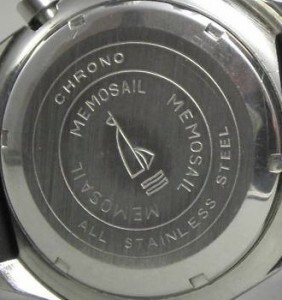 At some point in the mid 1970’s the Memosail regatta watch is sold as ‘V.I.P Memosail’ (also registered as a trademark name by Ebauches Electroniques SA). 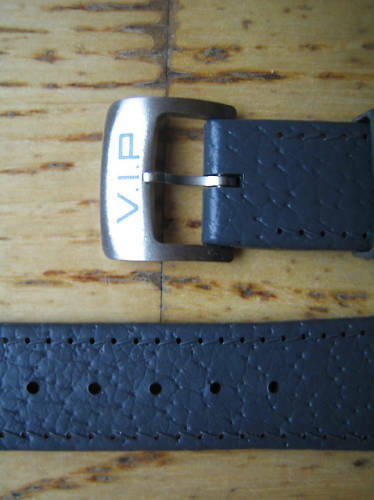 The addition of the name V.I.P is put on the dial and on the case back (it says ‘chrono V.I.P’ instead of just ‘chrono’). 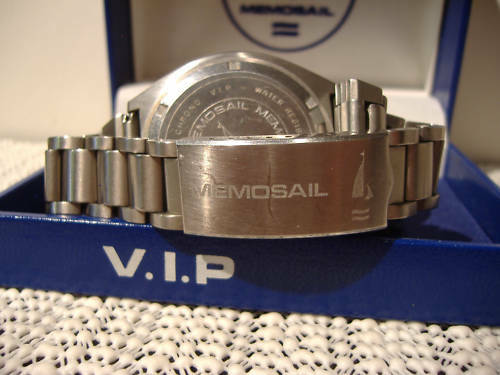 The V.I.P Memosail is available in a bigger barrel shaped case, and a cushion case. The movements are identical, the same Valjoux 7737. 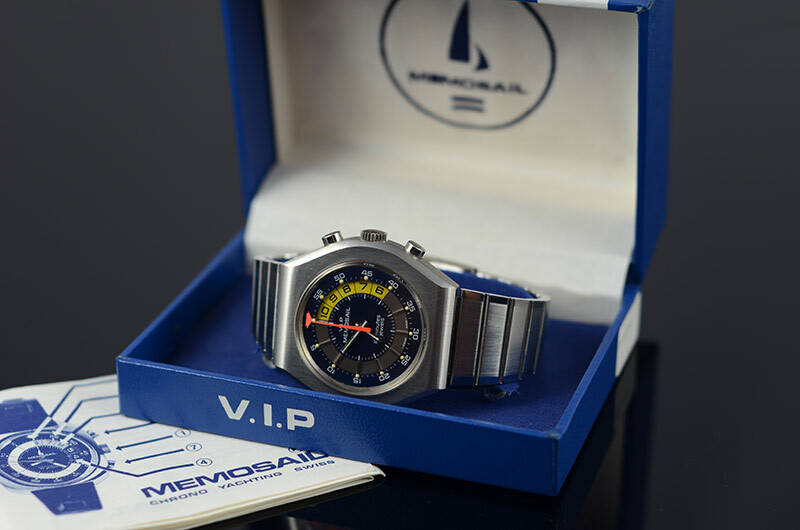 The V.I.P Memosail was delivered in a special box marked V.I.P, with the standard Memosail manual, and available with a blue/grey dial, a gold/grey dial or a much darker blue almost black/darkgrey dial. If the watch was delivered with a steel bracelet, it was the standard Memosail one. Known is also an rubber/silicone strap with a buckle printed V.I.P on it. I made the above compilation for Memosail and V.I.P Memosail based on my research over the last several years and looking at dozens of watches, pictures and articles. In my opinion all other configurations are non-original. But please correct me if I am wrong! Only very few times I came across a very rare version of the V.I.P Memosail. 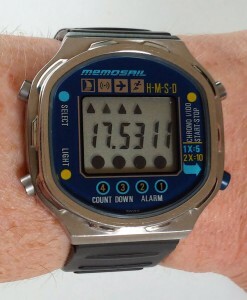 This one has the countdown window from 8 to 12 o’clock cut out from the dial. 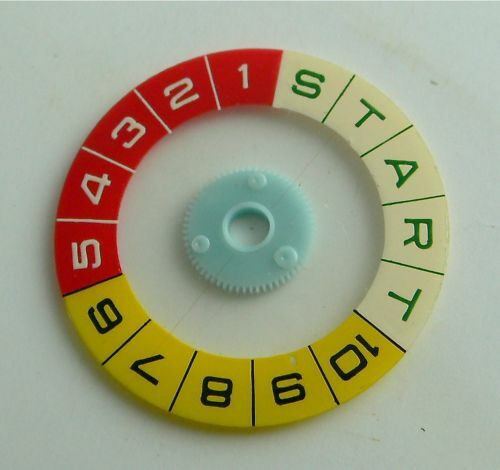 And with the numbering of the minutes in the opposite direction, the indicator disk runs clockwise. 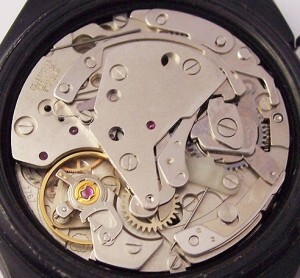 Inside is a Valjoux 7767 movement. 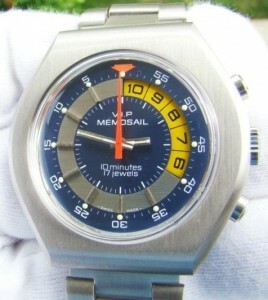 The dial is also coloured blue/grey. At first sight the caliber 7767 looks the same as the 7737. But there are some major differences. 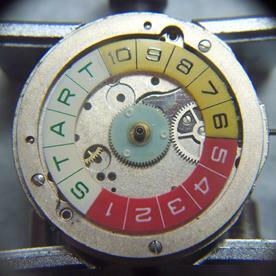 The indicator disk is running clockwise, instead of anti-clockwise, and it moves continuously (like for instance the Lemania 1345 and Valjoux 7757) instead of moving every 30 seconds. Furthermore the operation is the same. Size: 13¼” Ø 30,00 mm / 7 mm. 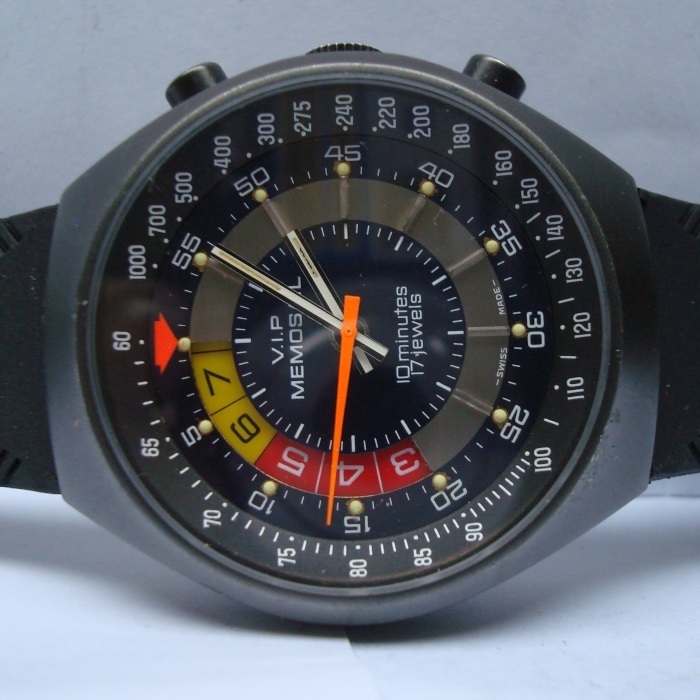 The Valjoux caliber 7767 is derived from caliber 7765, whereas 7765 is the manual wound version of the automatic 7750 basic movement. 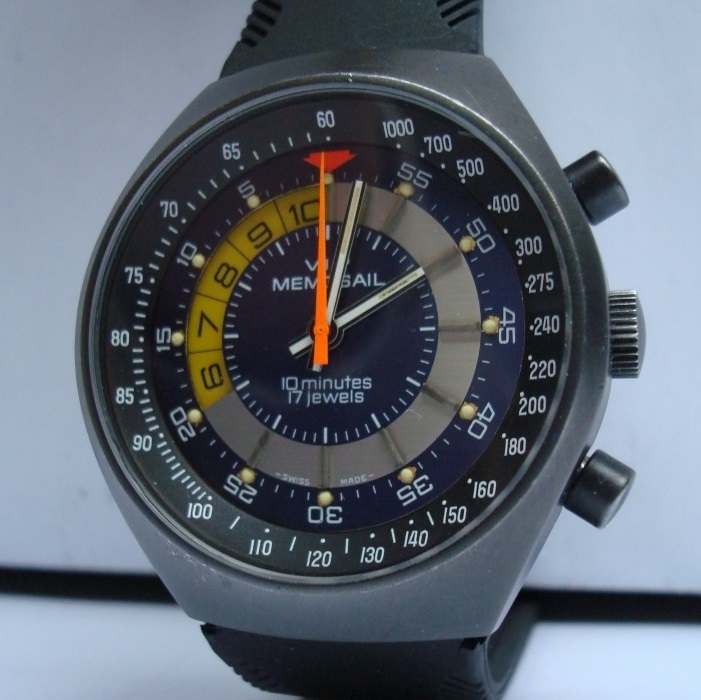 During the 1970’s and early 1980’s mechanical watches were largely replaced by quartz watches. As the Swiss watchmaking industry choose to remain focussed on traditional mechanical movements, this caused the decline of the entire industry and the majority of the world´s watch production shifted to Asian companies that embraced the new technology. Due to that many Swiss companies closed or went bankrupt. 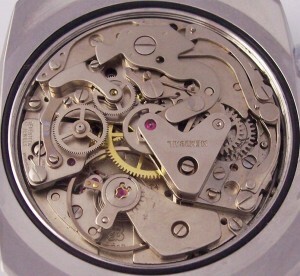 This period in the watchmaking industry is known as the ‘Quartz Crisis’. Obviously also Memosail suffered from the quartz crisis, and beginning of the 1980´s a quartz ESA/ETA movement driven yachttimer with LCD display was introduced, the Memosail Swiss Quartz. Probably this model wasn’t very popular, and thus only few numbers have been sold. 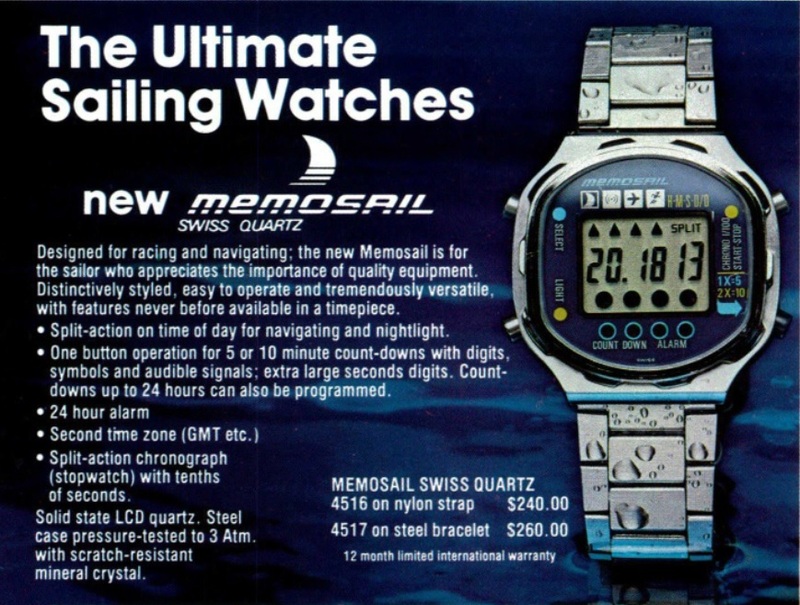 Ad for the Memosail Swiss Quartz in the January/February 1982 issue of the Hobie Hotline magazine. This is the end of part 1. 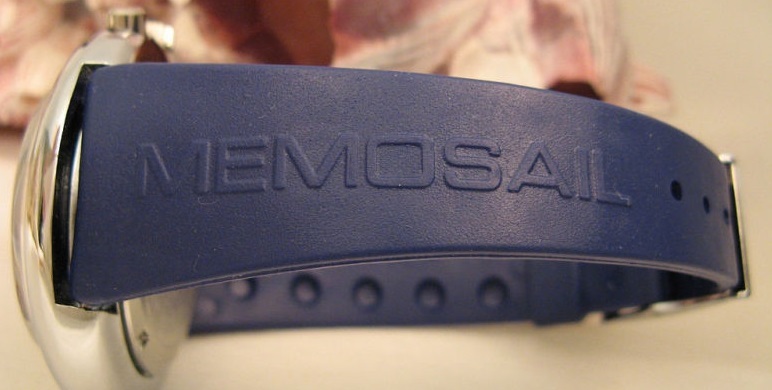 To be continued in the Memosail 1983 – 1999 section. 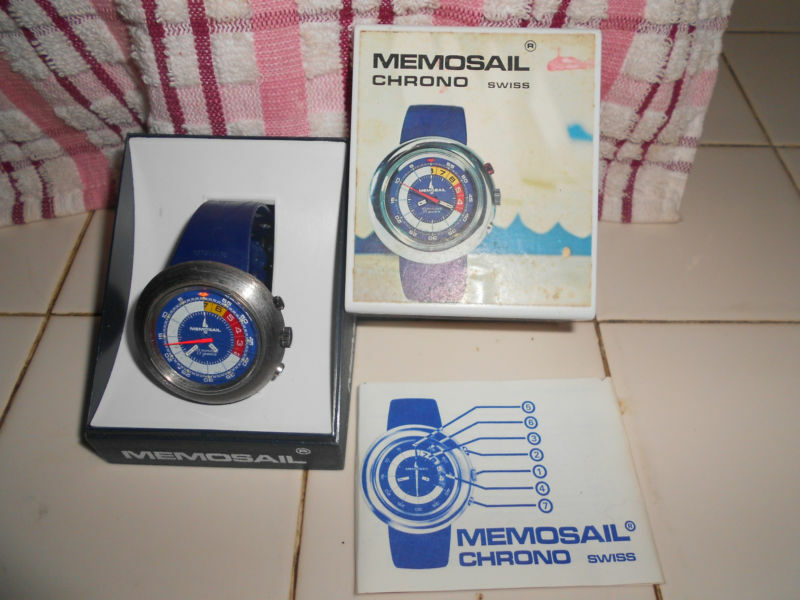 Many thanks to Richard Askham for your major contribution about the Memosail watches. 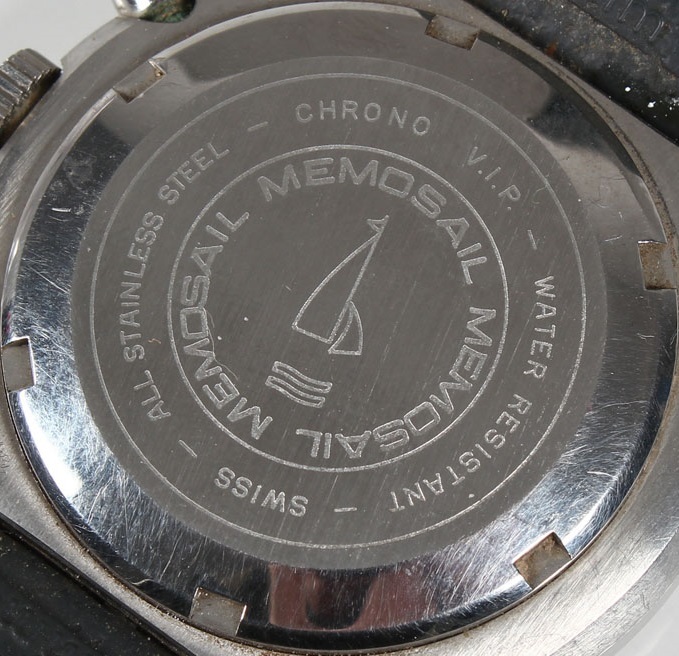 Many thanks to Eric Mulder for scanning your Memosail instruction manual for me. 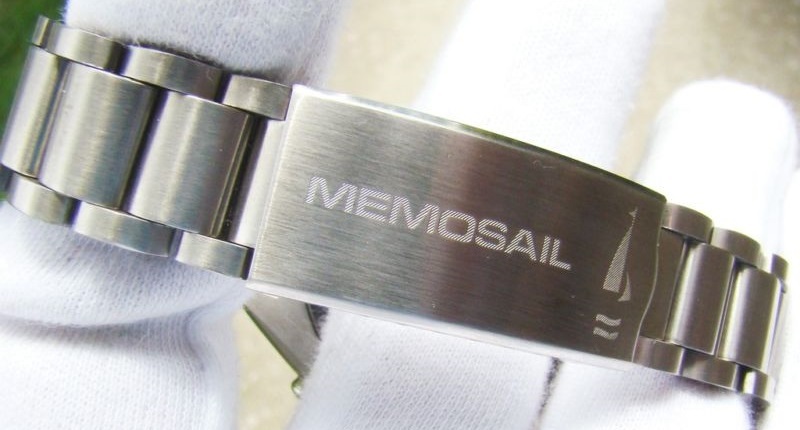 Many thanks to Bidle for your beautiful nice pictures of the Memosail-countdown. Many thanks to Joel Pynson for sending me the Valjoux 7737 patent.